For book tour information, click here. Jay Michaelson is among the most widely-read Jewish writers of his generation. A columnist for the Huffington Post, the Forward, and Tikkun, Zeek, and Reality Sandwich magazines, Michaelson was recently named to the “Forward 50” list of “the men and women who are leading the American Jewish community into the 21st century.” Long credited as a co-creator of the “New Jewish Culture,” the phenomenon of independent, non-denominational Jews creating new forms of music, spirituality and culture, Michaelson has written the first major book of Jewish theology and philosophy of his generation, Everything is God: The Radical Path of Nondual Judaism. “Nondual” simply means “not-two” — but its true meaning is far deeper. Usually it refers to Eastern religions or philosophies which say that “All is One.” But it is also a central teaching of the Kabbalah, the Jewish mystical tradition. For 700 years, Kabbalists have insisted that God is not some old man in the sky, but is everything we see and everything we are. According to the Kabbalah, this webpage is God — and so are you. Theologically, this view is a radical departure from traditional theism. 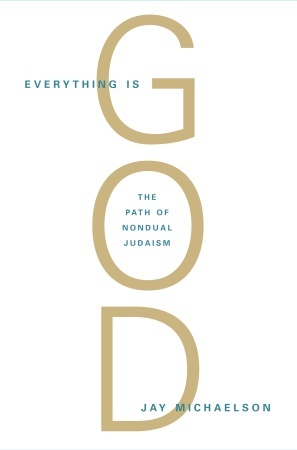 For nondual Judaism, God does not exist — God is existence itself. Experientially, God is simply all that is, once the illusion of the separate self is taken away. And religiously, this view is the basis of a total transformation of religious life. Religion is not about belief — in God, myth, or fundamentalist ideas of scripture — but love, and the obligations which spring from it. Meditation is not about cultivating special states of mind, but learning to accept that everything in life — even suffering, pain, and injustice — as God. And the call to justice becomes essential to the religious life; even if everything is perfect, it’s up to you to make it better. Everything Is God is both a scholarly work, with over 200 footnotes (Michaelson is completing his Ph.D. at the Hebrew University of Jerusalem), and a remarkably accessible one, with practical advice and contemporary anecdotes that illustrate how these ancient ideas transform the spiritual life, how God is present at CBGB’s (where Michaelson once played with his rock band) and Burning Man (where he teaches every year) as much as at the holiest of sacred sites. Bringing together Jewish, Buddhist, postmodern, and even pop cultural sources, Michaelson explains what this mystical nondual view means in our daily ego-centered lives, for our communities, and for the future of religion in an increasingly technological and multicultural age. Click here to read Professor Alan Brill’s review of Everything is God in the Forward. Click here to follow Jay Michaelson on Facebook. Jay Michaelson has written a book for serious Jewish cosmologists. It takes the contemporary Jew — and one who wants to understand Jewish religion in its depth — through a mind laundry. Stripping away the barnacles of outdated concepts, he aligns the best non-dual thinking in Judaism with the best the non-dual thinking in other profound systems. Nondual Judaism is a timely and necessary contribution. Jay Michaelson has written a poetic, detailed, and radical book expressing a Jewish language of oneness: not the oneness of a bearded man in the sky but the Oneness of a universe not divided against itself. Fittingly, Michaelson’s book is neither universalist nor particularist but a refreshing combination of both. He moves among kabbalists, Hindu and Buddhist philosophers, Western thinkers and psychologists, Chasidic masters, and examples of daily experience to clarify what non-dual thinking is and how humans achieve it in the midst of the maelstrom of ego-based life. Michaelson skillfully explores the mystical Jewish versions of “selflessness” and gives them a new and contemporary tone, reflecting on issues of prayer, meditation, consciousness and the physical body. He addresses accusations of heresy, quietism, and abstraction without defensiveness. Michaelson gives the reader a gift of self-beyond-the-self, a gift that cannot be owned but is well worth having.